Unfortunately, Cable found some serious sellers on the 38.2% Fibonacci retracement level and dropped like a rock last Friday. Risk aversion surged, this time over debt fears in Hungary and worse-than-expected results on the US non-farm payrolls. In hindsight, I should have entered when a doji-like candle formed instead of waiting for to head all the way to the 50% Fib. It was a good technical setup, but I failed to adjust to what price action was telling me. In any case, I’ll close my open orders now and look for ways to go long on the dollar this week. Stay tuned folks! 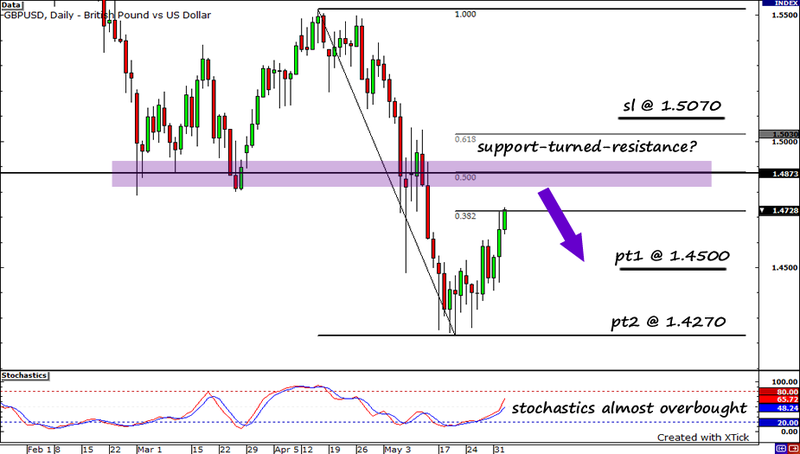 I know Pipcrawler has a short GBPUSD trade on, but the setup is just too good to ignore. Besides, I’m going to play it just a little bit differently. As you can see, I have setup my Fibs on the daily chart. Using the most recent swing high and low, I see potential resistance at the 50% Fibonacci retracement level. This price level served as a strong support level in the past, which means that we may possibly see the Cable bears jump in here. Additionally, if price continues upwards, stochastics will probably hit overbought territory and give me the confirmation I need to short. I think that the recent rise in the pound will be short lived, as it got a boost when AIG rejected a proposal from Prudential. I think this might just be a minor snag and down the road, they will come to agreeable terms. I mean, it’s a business deal! There are bound to be disagreements along the way, right? Looking at the economic calendar, I see that there are a lot of reports coming out that could provide the volatility to help my trade get triggered. On the east side of the Atlantic, both the Nationwide and Halifax HPI reports are scheduled to come out this week. Both indexes are expected to show that housing prices rose in the UK, which may give the pound another boost. Now, on the stateside, its employment data week, and we all know what that means – volatility! This week, we’ve got the ADP report, unemployment claims and the grandmamma of all economic reports, the NFP report! I’ve noticed in the past that all we’ve seen following the NFP report is big, choppy moves, but not a break in one direction. If this happens, I might get triggered but benefit from a fade! Right now, I’ve fundamentally biased towards the dollar because I think that risk sentiment will continue to be the dominating force in the markets. I think any rise in currencies like the euro or the pound will be treated like a sale at Forever 21 – traders will just be looking to buy the dollar at a cheaper price! I will set my stop above the 61.8% Fibonacci retracement level, which is roughly equal to the pair’s daily average true range. I will ultimately aim for the former lows, but I will take some profit off the table if price hits 1.4500. Additionally, to minimize risk, I will move my stop to breakeven if price moves 100 pips my way. Short GBPUSD 1.4870, pt1 at 1.4500, pt2 at 1.4270, sl at 1.5070. I will risk 1% of my account on this trade. 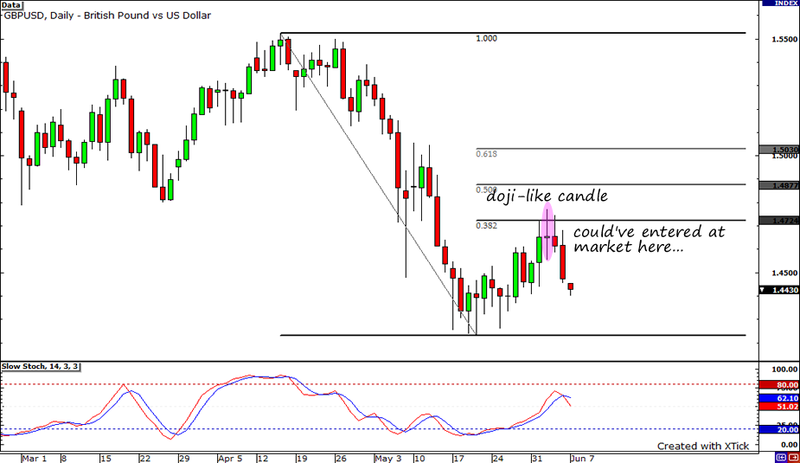 Don’t forget to check out my trade updates on MeetPips.com!